The maltier of my two ‘base’ saisons that I am developing, this beer uses Vienna as the base malt rather than Pilsner. To ensure it still finishes nice and dry, ~10% of the fermentables (by weight) will be clover/alfalfa honey. 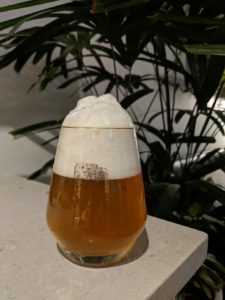 To start off simple (and because simple, rustic recipes tend to outperform complicated recipes when it comes to saison), that’s all the fermentables being used. Future iterations are likely to include small amounts of wheat and Munich. ‘Hollowed’ air lock with cheesecloth on top for 24-48h range. Unfortunately, this batch didn’t turn out. I am honestly not sure what the issue was, other than it did exhibit the “Dupont stall” and took 6 weeks to attenuate. Possibly an infection, possibly just poor fermentation. The carbonation was spot on, though!